Most warts don’t have hair growth. Is it possible for a wart to have hair growing out of it? Yes. Most warts don’t have hair growth, but some do. There are several reasons for this. Warts grow relatively fast. It takes time for a hair follicle to grow in the newly generated flesh of a wart. Additionally, the tough outer covering of most warts makes them unconducive to hair growth. If a wart grows over an existing follicle, in time the hair can grow right through and out of the wart. But it usually takes several months for the hair to grow long enough to reach and poke through the surface of the wart. Many warts have a tough outer covering that can prevent hair from breaking the surface. This is not true for all types of warts, however. The softer the wart, the more likely it may have hair growth. Plantar warts or verrucas, for example, are notably rough and tough. Thus, they are least likely to grow hair. Genital warts, on the other hand, are soft and fleshy, making them susceptible to hair growth. Remember, it takes time for hair to make it to the surface of a wart. So older, untreated warts are the most likely to sprout hair. If you have a new wart with hair, it’s possible that it may not actually be a wart. Are warts with hair growth dangerous? No. They may be ugly and uncomfortable, but all warts are benign, or non-cancerous. Hair growth from a wart is not usual, but it is also not a sign of a serious condition. 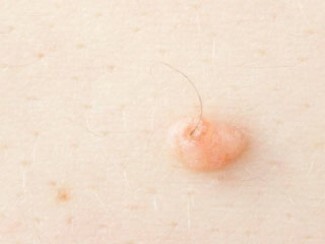 It’s easy to confuse warts with other skin issues, such as moles and ingrown hairs. Moles with hair are much more common than warts with hair. Sometimes moles and warts can look very similar, too. Before beginning treatment, it’s important to properly identify the issue. Moles are often brown or black, while warts are usually flesh colored. But some moles are flesh colored, too, making them difficult to differentiate. As a first-hand example, I had what I was sure was an unsightly wart on the side of my nose. But a visit to the dermatologist confirmed my suspected wart was actually a white, flesh-colored mole. When a hair grows inward instead of out of the skin, the hair follicle can get inflamed and infected. This is called an ingrown hair. People often mistake these for warts because they cause a pimply swelling on the skin. Ingrown hairs are often painful and red. On the other hand, warts usually are the same color as skin, and they do not hurt (with the plantar wart on the sole of the foot being a notable exception). If the wart is in a conspicuous location, it may be desirable and it is safe to trim any hair growth with a scissors. Once you are sure you are indeed dealing with a wart, you should go ahead and treat it. Many warts actually disappear on their own in time as the immune system fights the HPV virus that created the wart. But a wart with hair growth is probably an older wart that will require active removal. Wart removal is broadly successful via home treatment. In fact, t is estimated that more than 70 percent of warts do not require a visit to the doctor. Salicylic acid treatments are available over-the-counter in liquid, gel, and pad form. Only a few treatments usually fully removes a wart, depending on the size and type of wart. Links to these products are just below. If you want to go with a homeopathic treatment, thuja occidentalis is an essential oil that is great for removing warts. It burns away a wart when topically applied, similar to salicylic acid. Ingestible thuja tablets improve immune function and treat a wart “from the inside”. Whichever method you choose, be sure to learn the steps involved in proper wart removal to protect yourself from acquiring a painful wart infection.